Formula One’s had an iffy record with planned races lately, with the 2019 Miami Grand Prix debuting a mess of a proposed street course then getting pushed back until at least 2020. 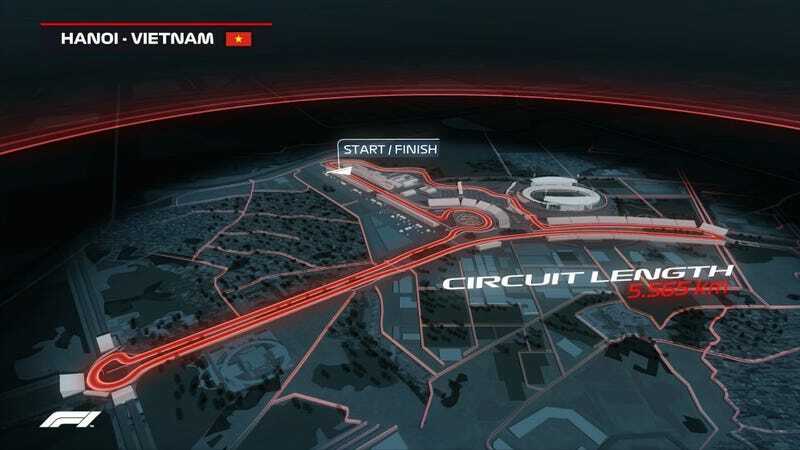 But F1 does, at least, have more solid plans for 2020: the Vietnam Grand Prix, which will run on part street course and part race track. F1 announced the Vietnam race this week, saying it would take place in the Vietnamese capital city of Hanoi in April of 2020. It’s the first new race to be announced since the series’ American owners Liberty Media bought F1 in 2016. And, according to the announcement, 2020 will be the start of a multi-year deal. Vietnam might not the racing history of Monaco or Macau, but the market makes sense for a grand prix. Vietnam suffered hugely under colonialism and was blown apart in the Vietnam War, but its economy is rapidly on the rise and has been for years now. Tourism is up along with the economy, per Forbes and travel-research company Skift. Obama went back not long ago. But to be fair, plenty of people don’t get NBC Sports even here in America. On top of that, F1 TV now has streaming available in Vietnam. F1’s talked about a Vietnam race before, with former CEO Bernie Ecclestone telling Forbes he got approached about a race there with the opportunity to meet the president about making a deal. Plans fell through for a track near the southern Ho Chi Minh City in 2010 because of local rules preventing people from betting on sports, according to Forbes, but things have changed since then. Late last year this law was relaxed for anyone with a monthly income of more than $440 and Vietnam’s first race track opened in 2016 to take advantage of it. Its standards are far below F1 specification, known as Grade 1 Homologation, but a track which would meet them was reportedly under consideration in 2016. It is understood that a foreign group was seeking investment to build it in Hanoi and carried out a feasibility study. But Ecclestone is gone, Liberty is in, and things seem to be moving forward with Vietnam. The 3.4-mile, 22-turn track for the race is set to use a mix of currently existing roads and some that will have to be paved for the race itself. As we explained when this planning went public last month, this has been called a “partially street based” course. But the part of the track that gets paved for the specifically for F1 will become a public road when the series isn’t in town. In its full track guide, F1 touts that the track uses a mix of corners pulled from other famous race tracks, but track designers always say that. The series did have an interesting way of describing the track layout, though: It wants the feel of a street race with the excitement of a permanent track. The aim was to create a unique hybrid layout, fusing a street circuit’s characteristics with a permanent countryside track layout within the confines of the city’s topography. There was a real desire to steer away from humdrum 90-degree road-junction type corners and foster a layout that facilitates wheel-to-wheel racing while retaining a closed-in street feel that makes city race tracks so demanding for drivers. We won’t know anything until cars are on it, but at the very least, this track looks better than the Miami ideas did.